Once your children have experienced the thrill of skiing or snow-boarding for the first time, there’s a good chance they’ll be hooked for life. Almost every corner of the globe offers a different but equally mind-blowing ski holiday – here are some of our family-friendly favourites. From the moment your plane descends between the snowy peaks of the aptly-named Remarkables mountain range to touch down at the foot of sparkling Lake Wakatipu, you’ll feel you’ve landed in a winter fairy tale. This beautiful setting is home to two incredible ski fields, Coronet Peak and The Remarkables, with two more equally stunning fields within little more than an hour’s drive. Both Queenstown fields offer a range of trails to tempt every level of ability, along with designated snow play areas where the whole family can enjoy tobogganing, making snowmen and generally having fun in the snow. Kids can enjoy tailored group or individual lessons, and if you buy a multi-day pass, you’ll have access to both ski fields. And if you fancy a day away from the snow, the region is New Zealand’s adventure capital, offering everything from ice-skating and luging to a vintage steamship cruise to a high-country sheep station. In the north of Italy, the region that is defined by and named for the limestone peaks of the Dolomites mountain range is one that is renowned for skiing. Although geologically separated by the River Adige from the rest of the mountain range, the Brenta Dolomites represent a particularly enticing combination of breath-taking views and divine snow conditions. 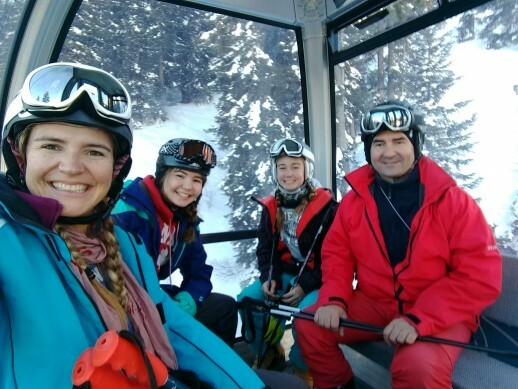 The most family-friendly ski area is Madonna di Campiglio, which is connected by gondola to several other ski areas to provide a vast ski terrain and kid-friendly activities such as dog sledding and snow shoeing. You can even treat the family to a thrilling night-time snow cat ride to the door of a welcoming mountain refugio, where you can choose to spend the night or simply sample their delicious northern Italian cuisine. There can be few better ways to end a day of skiing than by soaking in natural, mineral-rich hot pools, such as those offered in the nineteenth-century French spa town of St-Gervais. Located just an hour’s drive from lovely, lakeside Geneva, the pretty alpine town also offers an ice-skating rink, a weekly market where you can pick up all sorts of local treats, and access to a vast ski area that’s well-suited to beginner and intermediate skiers. There’s also the impossibly-scenic Mont Blanc Tramway to transport you to the Chamonix Valley’s Les Houches ski area, where a further 55 kilometres of mostly red and blue, kid-friendly, tree-lined runs await you. More than $400 million in silver was extracted from the ground around Park City in the late nineteenth and early twentieth centuries, and this heritage is still plainly evident in the many historic buildings that line its Main Street (but don’t let the name fool you – the town has a permanent population of around 7,500). The ski area, which is located an easy forty-minute drive from Salt Lake City, is the largest in North America, with an average snowfall of 355 inches, and is designed to make your family ski experience as hassle-free as possible: from a free, ski-friendly, bio-diesel bus system for getting around, to ski-in, ski-out access to the snow directly from Main Street. When the kids are ready for a change of scenery, there’s everything from snowmobile tours to sleigh rides, the Flying Eagle zipline and a toboggan-inspired Alpine Coaster. Japan’s northernmost island, Hokkaido, is renowned as a ski destination – in fact most local schools include skiing as part of their curriculum. The valleys of Kiroro, roughly an hour’s drive from the main city of Sapporo, are some of the snowiest on Earth and are revered for the quality of their powder, but the resort also prides itself on being family-friendly. Their ski academy offers classes for kids from three years old all the way up to competition level, while off-piste you can enjoy a traditional, Japanese onsen (hot spring) experience or a warming bowl of traditional Hokkaido ramen. A ski holiday can provide the whole family with magical shared memories, but it’s important to choose the right destination to suit your family’s needs. Whether you’re introducing your children to the fun and excitement of a ski holiday for the first time or you’re a family of seasoned experts, your personal travel manager can help you find the one that’s best for you.